Not your ordinary strawberry cheesecake! Instead of a baked cheesecake, this recipes calls for French toasts that are coated generously with luscious cream cheese and vanilla extract to act as layers of “cheesecake”. Finish it with strawberries and a generous dusting of icing sugar and VIOLA your own deconstructed strawberry cheesecake. Take 2 slices of bread and spread mixture on both sides. Press sliced strawberries on both slices & press together. Melt butter in a skillet on medium-low heat and cook bread for 2-3 minutes or until crumbs are crispy and bread is more solid. 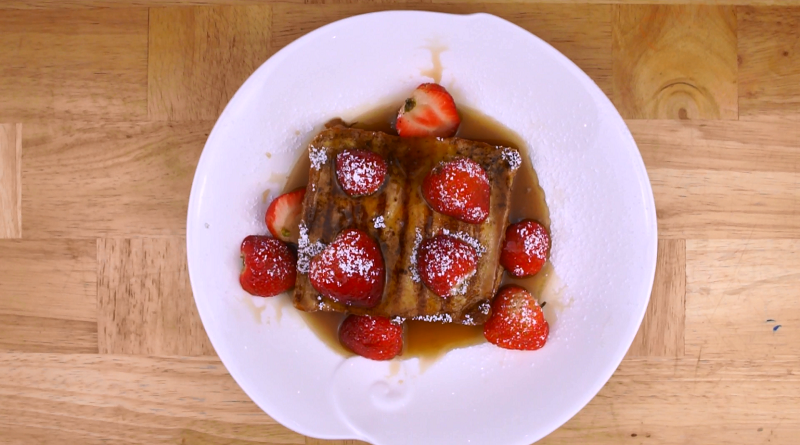 Stack and garnish with strawberries and confectioners’ sugar.